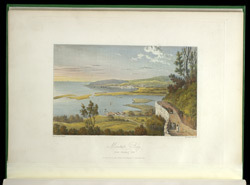 This print of Montego Bay is taken from James Hakewill's 'A Picturesque Tour in the Island of Jamaica.' In the 18th and 19th century Montego Bay was a busy trading port and was the second largest town on the island. This picture was drawn from Reading Hill and overlooks the estate and buildings of Mr Scott, which at this time were rented by Mr Home. In 1759 the Close Harbour Company was formed by residents of the town to raise money to build a breakwater to protect the ships in the harbour. In all, £45,000 was raised and the breakwater was a great success.